Music by the Rimsky-Korsakov String Quartet and local musicians Scott Durbin will be performing with jazz singer Anna Repetto, and our Carol Medrano Music Scholarship winner, Jakob Turner, and more. plus silent and live auctions. 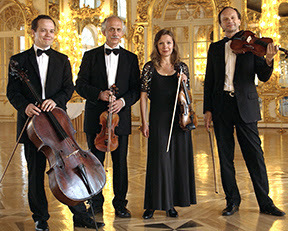 The Quartet has put together a concert dedicated to the 100th Anniversary of the Russian Revolution. during the early 20th Century. There will also be music by Joseph Hayden. RKSQ always provides a mesmerizing performance!